Q&A with our expert John. This article will help you to understand why you should choose Terrazzo tiles for your project. Terrazzo tiles - Eco Friendly. Beautiful. Modern production technique, Practical for tiling. Durable. Timeless. Why Terrazzo Tiles for your project? Well, not only is Terrazzo exquisitely beautiful in its unique variety, it is also the ultimate eco material! In this day an age where we have become more and more of the limitations of our natural resources, it’s even more important to make sure that we all take small steps towards contributing to the wider goal of looking after our planet. But Terrazzo has been around for centuries – I remember my grandmother’s house was full of it – why the sudden resurgence? Modern production techniques have meant that Terrazzo can now be used in a variety of different environments, both residential and commercial, and no longer requires specialist knowledge to lay. Where poured terrazzo once required weeks of drying, or dual layer terrazzo needed a floor that could take its weight and required polishing on site, single layer terrazzo comes pre-finished in honed, brushed, polished and sandblasted finishes, ready for quick fitting so it can be walked on almost immediately. Why has it suddenly become more popular? Well, in our experience, it never stopped being popular – it just wasn’t practical for many uses due to its thickness. But yes, for many years it was seen as a dull material, principally because the colour combinations were quite dull. Used mainly for its durability on train station platforms and supermarkets, the focus was on creating uniform flooring that could withstand extremely high levels of traffic, with block colours that could be easily replaced, but did not necessarily offer any aesthetic inspiration. With the new technology, modern, bespoke colour-combinations can be produced to create attractive new materials that will revitalize both offices and homes. Really, there’s nothing that can compete – either in terms of durability, sustainability and aesthetic. What about porcelain? There are some fantastic Terrazzo-effects on the market. There are indeed - but hold them up against a real terrazzo and you’ll see how bland and two dimensional they really are. Porcelain manufacturers will scan actual terrazzo tiles and lazer print them onto their material, but the printed picture will never hold the depth of a piece of Carrara marble 200 million years in the making. And don’t forget that porcelain needs to be fired to at least 1000 degrees Celsius. Imagine the energy that must go into achieving those heats. But many Porcelain Manufacturers are also producing eco-friendly material, what’s so special about Terrazzo? Yes, of course, Porcelain tile manufacturers are doing some fantastic work to make sure they reduce their footprint. But compare 40% recycled material with 80%. Take into account that Terrazzo only needs to dry once it has been mixed, and needs no high-powered energy investment for it to be ready for cutting. 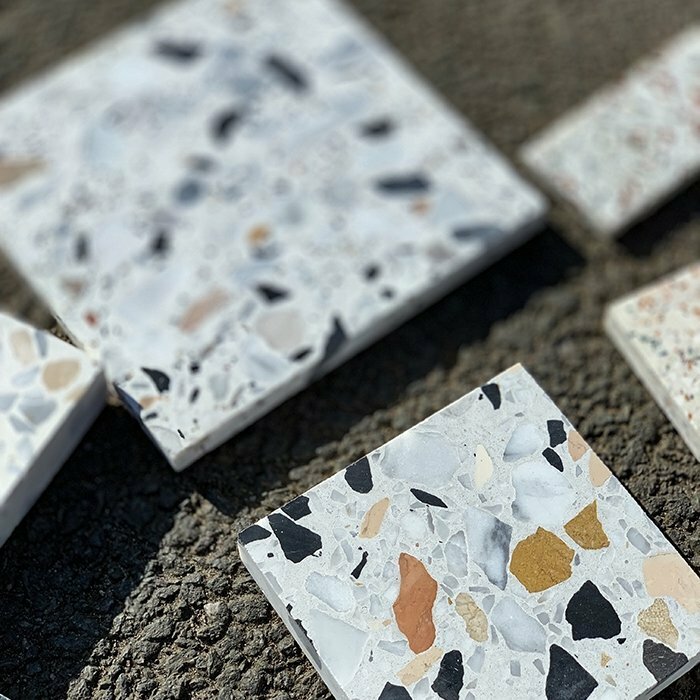 Terrazzo is a composite material made from a blend of recycled and locally sourced natural stone (usually marble) chips, set into pigmented cement. Our Terrazzo is LEED certified which will helps your build reach its environmental goals. If you’re looking for a floor or wall covering that is ecologically friendly, then terrazzo can’t be beaten. Terrazzo has made a massive resurgence – David Chipperfield Architects using it in the Valentino stores to Heathrow Terminal 5, we’re starting to see terrazzo everywhere. Do you think that the commercial trend will translate to people’s home’s? It’s true that this trend has come from architects looking for ecological materials that will increase the sustainability of their projects. The modern technology has lead to these materials being very attractive to the eye and the designers and magazines have noticed. Many of our design clients have been trying to specify this material for their residential clients for at least a couple of years, but it hasn’t quite become mainstream. Now that several interior magazines have picked it up including Vogue and Elle, the possibilities of terrazzo have become more widely recognized. 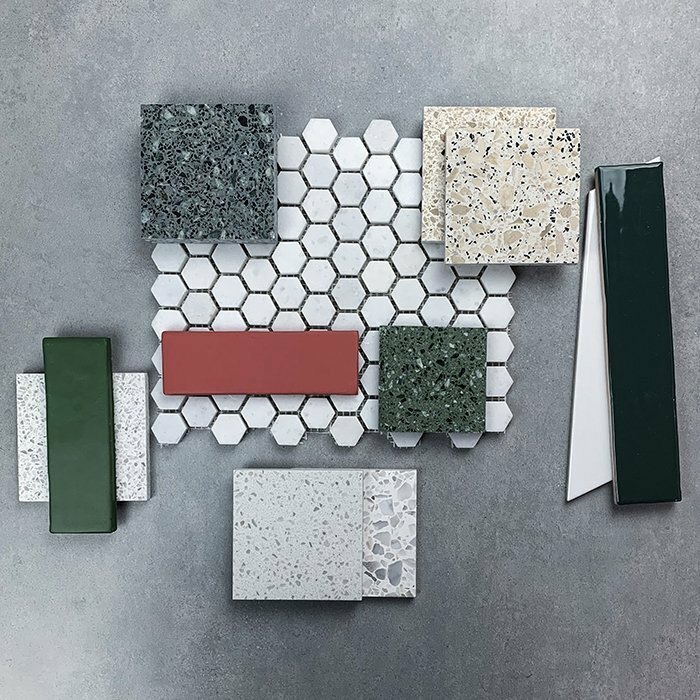 The fact that it can be made with different materials in addition to stone such as glass and even metal means that Terrazzo composites could potentially have a long future. Terrazzo pushed away the trend in Natural Stone, and I think that its here to stay. Nothing can compete with it ecologically and economically it easily competes with both stone and porcelain. Well, I’ve mentioned that it’s extremely durable – if laid and sealed properly, terrazzo flooring should give a lifetime of service. It does need a little help to keep it pristine, much like natural stone, but it can also be sanded and polished at any time to bring it back to its original beauty. So you have to seal them? Well, both cement and natural stone are slightly porous, so to make sure the tiles don’t get stained, we advise sealing them when they are laid and then every 12-18 months depending on the use. Doesn’t that mean they’re not very practical? 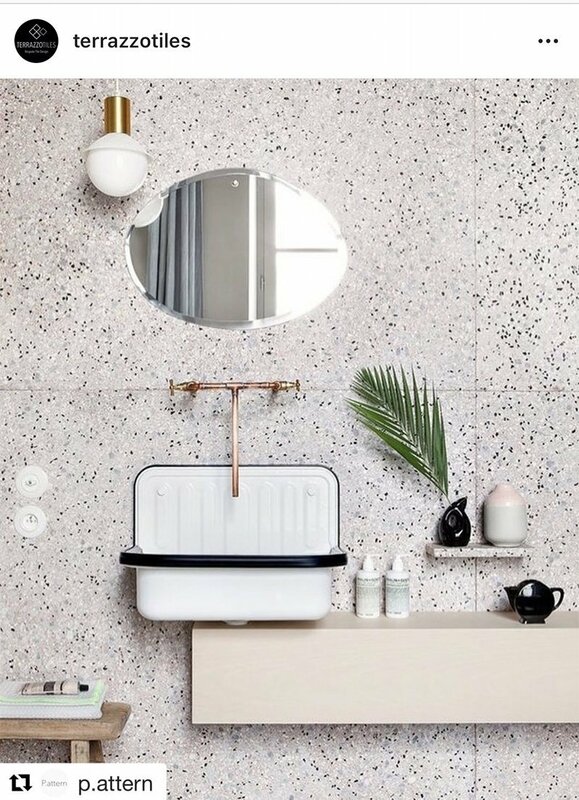 There is always a trade-off between practicality and aesthetic… luckily, in the case of terrazzo, its not so extreme as it is with say, natural stone or cement tiles. Yes, the tiles need to be sealed, but they are much more dense than cement tiles, and when they do mark, it is far less noticeable than it is with a patterned tile or even a marble, for example. Where wouldn’t you use Terrazzo? That’s a good question – this new single layer material is so versatile that the only places where I would think twice would be in old buildings where the floor hasn’t been reinforced. 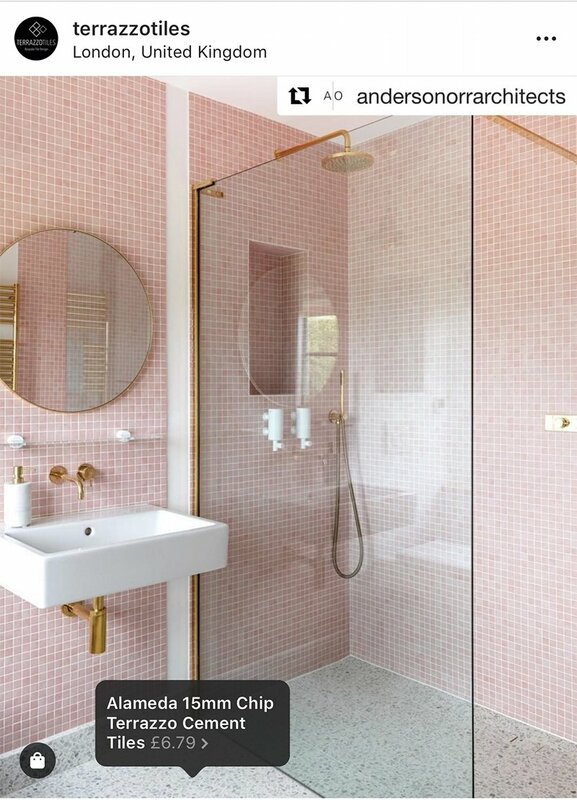 Its also important that 20mm terrazzo is not used on plaster or plasterboard walls, where the maximum weight is around 37kgs/m2 (20mm terrazzo weighs 50kgs/m2). 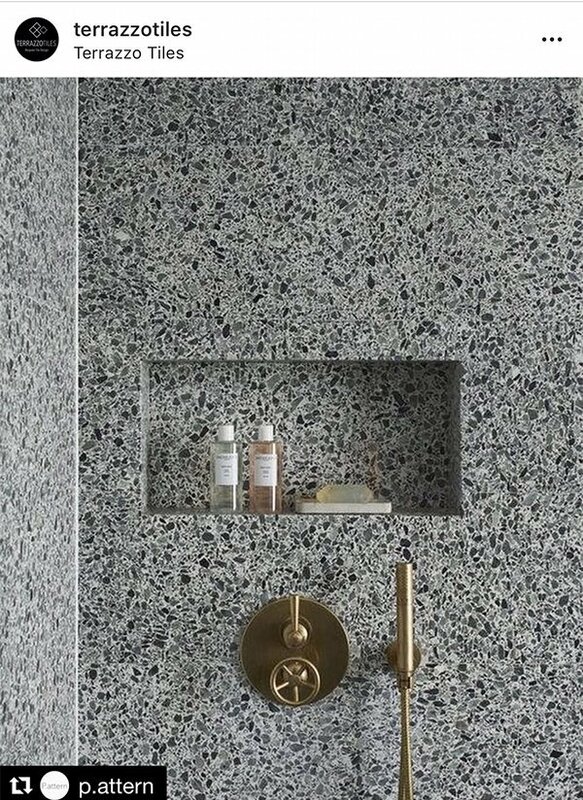 We have however found a solution to this with our Essential range, by offering our Terrazzo Slim range which comes in 10mm thickness specially designed for walls. Can that thickness be used for floors? No, terrazzo in 10mm thickness is not suitable for floors. For floors we recommend 20mm for all tile dimensions up to 600mm*600mm. For sizes larger than that up to 1200mm*1200mm we recommend 30mm thickness. For walls, we can supply slabs up to 3050mm*1250mm in 20mm thickness. What kind of projects do you think would benefit from Terrazzo? Modern single-layer terrazzo is such a versatile material that it can fit with almost any project, from commercial restaurant specifications to hotel fit outs where a slip rating of PTV>36 wet or PTV>42 wet is required. Because of modern single-layer technology, Terrazzo is now so light that it can be used in a multitude of residential setting, bringing natural, eco-friendly beauty into the home. What advice do you have for people looking for Terrazzo? 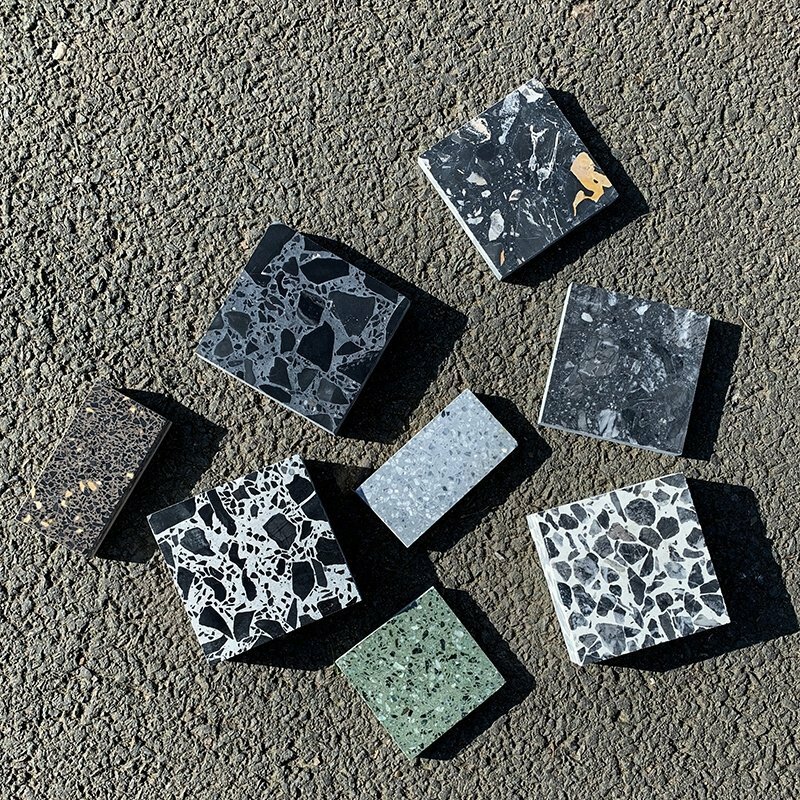 Well, we hold an extensive range of different terrazzo styles, ranging from small format, small chips up to large slabs with large pieces of embedded marble. We work with a number of exclusive factories who produce a variety of different styles and combinations of colours. 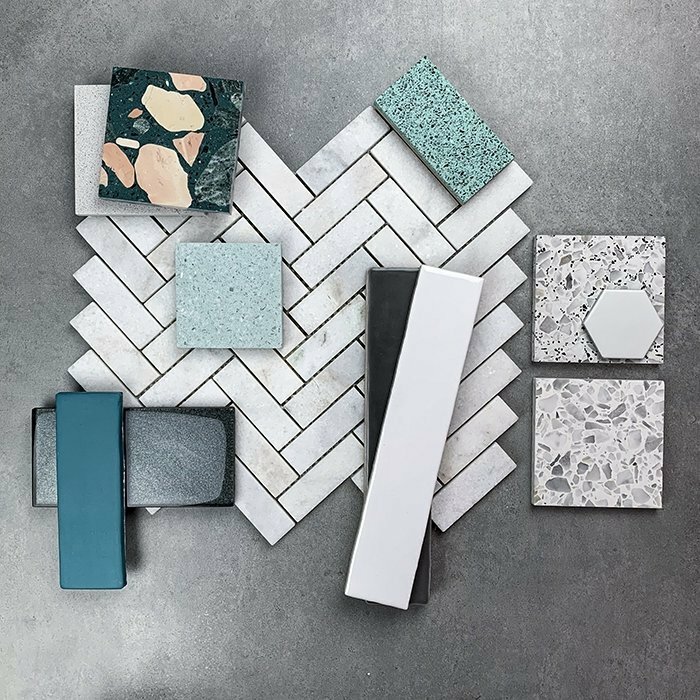 You have a great display of Terrazzo Tiles at your showroom in Belsize Park – is there any way for those outside London to appreciate them? We’d always recommend that people touch and feel the material before making any decisions – colours and textures can look very different through a computer screen. If you’d like to see our material but getting into London is a bit of a trek, we have a sample service that you can use – we can send swatch samples all over the world. Get in touch with our experienced sales team to discuss your project – our expertise is finding exactly what you are looking for. Terrazzo Tiles is a Tile retailer and wholesaler based in NW3, London. They specialize in Terrazzo Cement Tiles, Terrazzo Resin Tiles, Encaustic Cement Tiles and Zellige Tiles.